The Association of Bermuda Insurers & Reinsurers [ABIR] announces leadership appointments of industry executives. ABIR announces the appointment of Leila Madeiros to Chair of its Policy Committee. The Policy Committee serves as the chief policy body of ABIR, with review of insurance regulation in Bermuda and overseas, international regulatory standards, public policy in Bermuda, and US natural disaster policy and insurance regulation. Ms. Madeiros serves as Head of Compliance & Regulatory Affairs, Bermuda, for XL Group Ltd. She also serves as part of XL Group’s team on international regulatory and policy issues. Previous to joining XL, she was Senior Vice President, Deputy Director and Corporate Secretary of ABIR, for the past 12 years. During that time, she led ABIR’s efforts in Bermuda, specifically managing ABIR’s policy development work related to Bermuda’s efforts to ensure that the BMA’s regulatory regime is equivalent to international standards. In particular, she led ABIR’s efforts with regard to Bermuda’s successful, milestone Solvency II equivalency project. Prior to joining ABIR, Ms. Madeiros was the Deputy Director of Policy, Research and Communications at the Bermuda Monetary Authority [BMA] directing the formulation and dissemination of appropriate policies, strategies and information for the BMA. She also served in various capacities as a Bermuda insurance regulator with the Registrar of Companies Department [prior to 2002, the agency charged with insurance supervision in Bermuda]. She developed her insurance expertise working at Heddington Insurance Limited in Hamilton, Bermuda and London, UK before becoming an insurance regulator. Ms. Madeiros succeeds Stephen Weinstein, Senior Vice President and Group General Counsel of RenaissanceRe Holdings Ltd. Mr. Weinstein also serves as Chair of RenaissanceRe Risk Sciences Foundation, the company’s non-profit research organization that innovates in risk-mitigation techniques and awareness, exemplified by the Risk Mitigation Leadership Forum. Mr. Weinstein led the ABIR Policy Committee in facilitating substantial policy regulation work to help achieve and maintain the recognition of Bermuda under US, EU and international regimes, address tax law changes, strengthen Bermuda’s leadership position in respect of InsurTech and other innovative solution frameworks for policyholders, and efforts geared towards closing the global insurance protection gap. ABIR also announces the appointment of Michelle Seymour Smith to serve on the Financial Committee. The Financial Committee reviews and approves annual financial activity and provides guidance for the investments, expenses and income of the association. It is comprised of the ABIR Treasurer and two additional member company executives. Ms. Seymour Smith is the Chief Financial Officer and Chief Operating Officer of Arch Reinsurance Ltd. responsible for the financial operations of the insurance, reinsurance and mortgage divisions and their subsidiary reinsurance operations in Europe and Dubai. She has over 20 years of experience in the insurance and reinsurance industry. Prior to joining Arch Reinsurance Ltd., Ms. Seymour Smith was the Vice President of Financial Reporting at XL [formerly XL Capital Ltd.] and Assistant Controller for Zurich Insurance Global Energy. In 2015, Ms. Seymour Smith was named to a list of 100 Influential Women in Insurance and Reinsurance by the Intelligent Insurer and to a list of 40 Influential Women in Bermuda by Bermuda Re+ILS. She is a member of Chartered Profession Accountants Bermuda and Canada. “As ABIR marks its 25 years of innovation, growth and leadership, we celebrate the richly diverse talent in Bermuda. 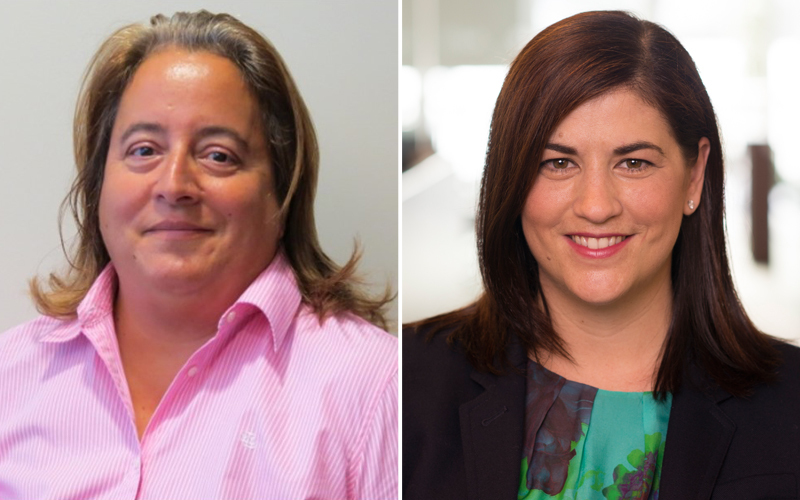 We are extremely fortunate to have Leila and Michelle join us in these leadership roles,” said John M. Huff, President & CEO of ABIR. Congratulations to both Leila and Michelle! These are well deserved accomplishments.